Tacos dorados from La Taqueria. Photo by Blair Heagerty Photography. Two kinds of shakshuka are at Oren’s Hummus for breakfast. Photo courtesy of Oren’s Hummus. The Magnolia breakfast sandwich. Photo: David Martinez. 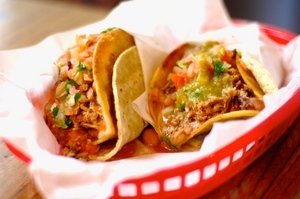 Everyone can exhale, your carnitas burritos and tacos dorados are safe: fortunately ~LA TAQUERIA~ owner Miguel Jara Sr. was able to bid and buy the location for $1.7 million, after an inheritance dispute with his siblings threatened the famed taqueria’s future. You can read more in the Chronicle here. 2889 Mission St. at 25th St.
A couple reopening reminders: ~IZAKAYA SUSHI RAN~ is opening in the former Nomica on Friday December 1st (2223 Market St. at Sanchez), and ~ALFRED’S STEAKHOUSE~ is taking reservations for after December 3rd. You can read a past tablehopper recap here if either of these stories are news to you! 659 Merchant St. at Kearny, 415-781-7058. Congrats to all the GGRA Saucy Award winners—unfortunately I received the list after my deadline. Take a look here and see who won—there were a bunch of great categories. Congrats to all. Looking for a new breakfast spot? Love shakshuka? Uh huh. 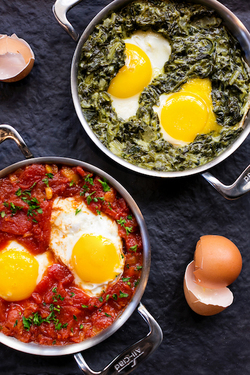 ~OREN’S HUMMUS~ in SoMa has launched breakfast, with both traditional or green shakshuka (made with spinach and kale cream sauce), Israeli breakfast, challah French toast, hash and eggs, and more. Served Mon-Fri 8am-11am and Sat-Sun 8am-2pm. 71 3rd St. at Jessie. Also in SoMa: ~ALX GASTROPUB~ has kicked off Sunday brunch service, with duck confit croquettes with blue corn “Jessie” cakes (executive chef Jessie Lugo’s play on “Johnny cakes”); duck eggs Benedict with a miso English muffin and foie-llandaise sauce (it’s like they’re trying to kill you! ); and a brioche French toast Monte Cristo with prosciutto and Monterey Jack. (Just be sure to check the prices on the website menu before heading over—it’s a bit steep, even if the ingredients are on the luxurious side of things.) There are cocktails, mimosas with freshly squeezed juice, Bloody Marys, and more. Sundays 11am-3pm. 680 Folsom St. at Hawthorne. One more brunch option: ~MAGNOLIA DOGPATCH~ brewery and restaurant is also serving weekend brunch, Sat-Sun 10am-3pm. 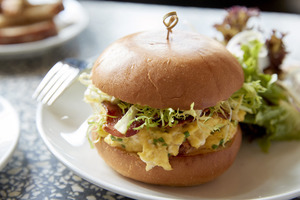 The menu includes a Magnolia breakfast sandwich with scrambled eggs, hash browns, frisée, sambal chili mayo, chives, and choice of bacon or sausage; croque madame; and a breakfast flatbread: choice of bacon or sausage, sunny-side-up egg, hash browns, caramelized onion, Parmesan, and arugula. They also started weekday lunch service (11am-4pm) and happy hour (3pm-6pm daily). 2505 3rd St. at 22nd St. Looking for a new lunch spot? The Jamaican ~KAYA~ in Mid-Market launched weekday lunch service, served Tue-Fri 11am-2pm. Chef Nigel Jones is offering sweet plantains with black bean sauce and sour cream; pulled-oxtail hash with a sunny-side-up egg: curry vegetables with rice, peas, and plantains; and a jerk chicken sandwich. They added some non-alcoholic beverages, although you can go for a boozy rum drink if that’s how you roll. 1420 Market St. at Fell.